Poured concrete is a popular choice for ultra sleek and chic modern pools, though many are also taking advantage of tinted concrete options and stamped concrete. 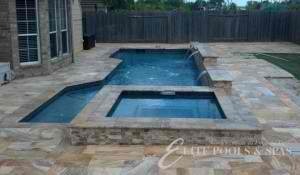 One of the most popular today: exposed aggregate which gives your pool deck some added shimmer and diversity. This type of backyard deck works well with almost any outdoor living space, though is very common in tropical backyard oasis settings. Pavers are an economical choice for creating a unique outdoor living space given their diversity and engaging visual appeal, and can work well in almost any outdoor setting. Though less common today than it was a in the past century, brick is still one of the most attractive options for a number of homes today. Homes that include brick elements in its architecture, for example, are perfect contenders for this type of deck. Depending on the type of wood chosen, homeowners can spend an extraordinary amount for their wood deck. Exotic hardwood decks such as ipe are on trend this year, however keep in mind that these highly attractive decks not only come with a steep price, but with a lot of maintenance in order to look their best. A stone backyard deck is usually laid into a poured concrete slab or they may be embedded in larger flagstones. Stone is an attractive option for custom pools because of the wide range of options available and the material’s ability to absorb excessive heat.